A group exhibition – Alaka, Adams, Ferreira, Noble, Schneider, Solomon & Wright. 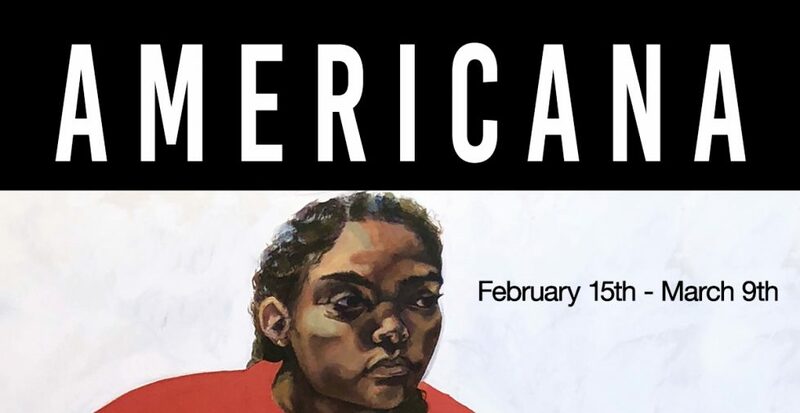 Modified Arts presents Americana a collaborative group exhibition featuring the work of Merryn Alaka, Mia Adams, Kareem Ferreira, Briana Noble, Kennady Schneider, Papay Solomon & Jonathan Wright. Reflecting on deeply significant scopes of culture and subjectivity, history and re-created narratives, each artist encompasses a variety of perspectives and experiences. Either grappling with tensions of cultural milieu or the politicization of black lives, together these artists find common ground by creating a narrative of the complex, fluid, and diverse encounters with a black identity in a highly political world. The exhibition is a collection of paintings, prints, sculptures, and photographs that all confront, question, and reveal a more complete knowledge of the world as it is lived from multiple perspectives of a diaspora.